French Coffee Press - 8 Cup/4 Mug Stainless Steel Coffee & Tea Maker. 1 Liter | 34 Oz Coffee and Tea Pot With Heat Resistant Glass/Carafe. Patented Lid Locking System. You must be wondering: "Which french coffee press should I go with...?" • ULTRA THICK BROSILICATE GLASS - Provides truly durable, crack-proof glass. • DOUBLE LAYER FILTER - Guarantees to keep the grains out of your cup. • REMOVABLE GLASS - Makes it incredibly easy to clean and even use the glass as a container to keep condiments in the kitchen. • PATENTED LID LOCKING SYSTEM - Specially designed lid ensures mess-free pouring and keeps your coffee/tea hot for several hours. • SMART SHIPPING PACKAGE - No surprises when you send FortLuxe as a gift. All of our products come with 1-year craftsmanship warranty and 60 days money back guarantee! You have absolutely no risk to buy FortLuxe Coffee Press today! If you are not satisfied with our product, we will return your money back no questions asked. VODIY FORTLUXE FRENCH PRESS COFFEE AND TEA MAKER - Combines quality, taste, luxury and durability. This french coffee press brews delicious coffee and tea in style. It is made from durable stainless steel frame and heat resistant borosilicate glass. The carafe can also be used as container in your kitchen. 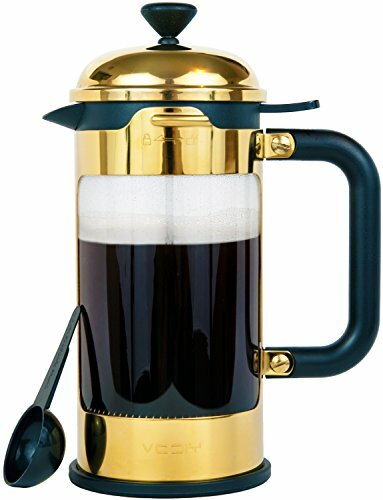 AUTHENTIC COFFEE TASTE - This 34 Oz coffee and espresso maker is equipped with DOUBLE FILTER screen that fits tightly in the carafe leaving no grounds in your coffee for pure coffee taste. As a bonus Fortluxe french press includes 1 coffee/tea spoon and 2 replacement double filter screens. PATENTED LID LOCKING DESIGN - Your coffee stays warm thanks to a patented lid locking system of Fortluxe. Unlike other typical french presses, Fortluxe's lid is designed to keep the heat in the pot keeping your coffee/tea warm longer. This pot features BPS/BPA free lid that is easy to clean. IDEAL GIFT - Beautifully packaged french press can be a great gift for your loved ones for any occasion including birthdays, father's day, mother's day, weddings, house warming, Christmas, etc. 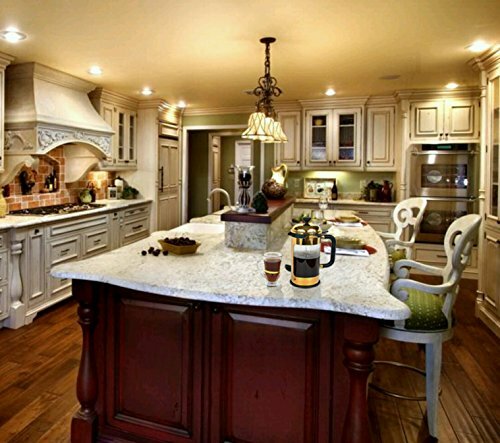 Fortluxe can be used to prepare not only coffee but also iced tea, lemonade, frothed milk, hot chocolate, and so on. ORDER NOW - with peace of mind due to our 60-day "better than money back" guarantee. No catches. See product description below for more information.